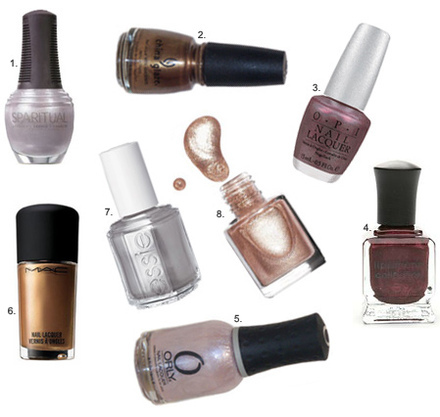 OPI Nail Envy – Hall of Fame Worthy? Pros – brings nails back to tip top shape. Cons – wish this was a weekly treatment instead of daily. Need to get your ‘tips and toes in the holiday mood? NICOLE BY OPI may have your answer with their Merry Must Have Kit in Pewter/Red (Chrome for the Holidays and You Can Sleigh That Again) and the Merry Must Have Kit in Pink/Purple (Brrr Brrr Burgundy and Come In From the Coal’d). $10 each set @ ulta.com. Wanna see swatches? Click after the pics! Charmed By A Snake, Royal Rajah Ruby, Curry Up Don’t Be Late, Get Me To The Taj On Time, Keys To My Karma, I’m India Mood For Love.